Torrence's Tavern, located ten miles east of Beattie's Ford across the Catawba River on the road to Salisbury in present-day Iredell County, was the site of a stinging Revolutionary War defeat that the Whig militia suffered at the hands of the British cavalry under Lt. Col. Banastre Tarleton. After successfully crossing the Catawba River on the morning of 1 Feb. 1781, British commander Lord Charles Cornwallis dispatched Tarleton with his green-clad cavalry and the 23rd Regiment Bose Infantry to pursue the fleeing militiamen. Prisoners taken by the cavalrymen revealed that the Whigs had fled Beattie's Ford upstream as well and were falling back toward Salisbury. Heavy rains made progress difficult, especially for the British infantry, so Tarleton decided to divide his forces in an effort to overtake the enemy. The 23rd Regiment was posted along the Salisbury road five miles from Beattie's Ford, while the horsemen continued their pursuit. Three miles farther along, Tarleton learned that the Whig militiamen he was pursuing were planning to rendezvous with militia from Rowan and Mecklenburg Counties a few miles farther on at Torrence's Tavern. A motley assemblage of people had gathered at Torrence's on that day-among them militiamen, fugitives from the morning's battle, and "South Carolina refugees." Col. Joseph Graham noted, "Being wet, cold and hungry, they began to drink spirits, carrying it out in pailsful." Amid the mass of wagons, horses and humanity clogging the road, someone sounded the alarm that Tarleton was near. This created a great deal of confusion among the Whigs. Capt. Nathaniel M. Martin attempted to organize a hasty defense and ordered the militiamen to take cover behind a fence and fight the enemy from there. Detached so far in advance of his support, with his confidence still hurting from the recent defeat at the Battle of Cowpens, Tarleton hesitated to attack. But considering his superior numbers and his ability to retreat to safety if necessary, he decided to make one charge at the enemy. Another key point in his decision was the inclement weather, the heavy rain giving a decided advantage to his saber-wielding troopers. The fight that followed was brief but intense. One of the first victims of the British attack was Martin, who was pinned under his dead horse and captured. The Whig militia fired one volley, then broke into a retreat. Whig chroniclers have often downplayed the results of the British victory at Torrence's Tavern, maintaining that the few casualties suffered were unarmed old men. In addition, Tarleton is often accused of exaggerating these events, mainly to make up for his earlier defeat at Cowpens. But in his report of 17 Mar. 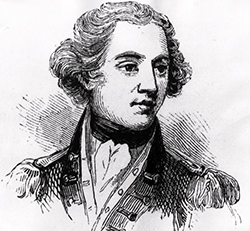 1781 to Lord George Germain, Cornwallis remarked on the importance of the engagement at Torrence's Tavern: "This stroke, with our passage of the ford, so effectually dispirited the militia, that we met with no further opposition on our march to the Yadkin." John S. Pancake, This Destructive War: The British Campaign in the Carolinas, 1780-1782 (1985). Banastre Tarleton, A History of the Campaigns of 1780 and 1781 in the Southern Provinces of North America (1787). "Photograph, Accession #: H.1952.67.2." North Carolina Museum of History from: Lossing, Benson J. The Pictorial Field-Book Of The Revolution, Volume Two. New York. 1859.